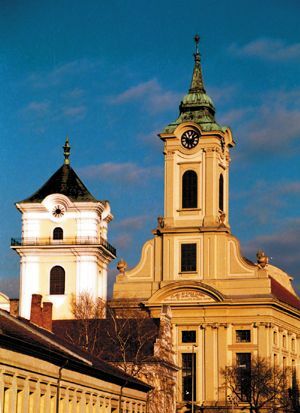 Town of county rank, one of the economic, transport and cultural centres of the south-east region, seat of Békés county since 1950. The town with 67,000 inhabitants is often referred to be the eastern gate of the country. The roads No. 44 and 47 meet in its vicinity. The motorway No. 5 is about 120km, the capital is nearly 200km from here. Its airport with its grassy runway is suitable for receiving smaller private planes. The Eclectic Town Hall was planned by Miklós Ybl. The Calvinist Great Church houses classical music concerts. The Munkácsy Mihály Museum and Memorial house presents not only the works of the world famous painter, but the works of contemporary artists. Besides this it also has exhibitions on local history, ethnography and nature. The Jesus' heart church in the suburb is visited by a lot of people. The atmospheric old Fiume Hotel was built in 1866. The Fresh-water canal and the promenade on its bank give unique experience to the walkers in all seasons. In the Árpád grove there is an open air bath (with warm and cold water pools) for holiday makers. The István Mill and the Kner Printing Press are of special significance in the history of Hungarian industry. Village at the backwater of the river Fehér-Körös. Its U-shaped, single-story baroque mansion was built in 1854, according to plans by Miklós Ybl. The chapel, built centrally in the mansion, remained in its original state of 1869. The park of the mansion is a nature conservation area.